This series has all discerning features one needs while keeping focus on simplicity and value. All hot tubs in this series are dual pump systems providing the absolute best hydrotherapy available. Whirlpool Flow *DTS™, stainless steel adjustable jetting, Northern Light Package *NLP™ which includes: backlit waterfall, jet lighting, wall lighting, cupholder lighting, sconce lighting on the outer cabinet and the highest jet count in their series. Truly the top of the line and at a cost far less than competitors, the Luxury Series value speaks for itself. This series is for those that want more jet pressure in their Hydrotherapy. 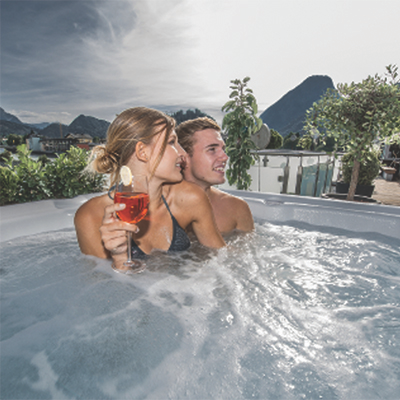 These hot tubs are found also in the Modern Series but have increased horsepower to deliver the highest water flow available. Along with more hydrotherapy power this series also comes standard with our Northern Light Package *NLP™ which includes: backlit waterfall, jet lighting, wall lighting, cupholder lighting and sconce lighting on the outer cabinet. Whirlpool Flow *DTS™ and adjustable stainless steel jetting are also standard in this series. This series contains different shapes and sizes to fulfill anyone’s needs. With stylish and comfortable models this series offers an array of seating capacity, depth, unique layouts, and all are convertible for 110v or 220v electrical hook ups. Whirlpool Flow *DTS™, adjustable stainless steel jetting and an LED light are standard in this series. Northern Light Package *NLP™ is an option in this series. This series is what started the Nordic Passion. 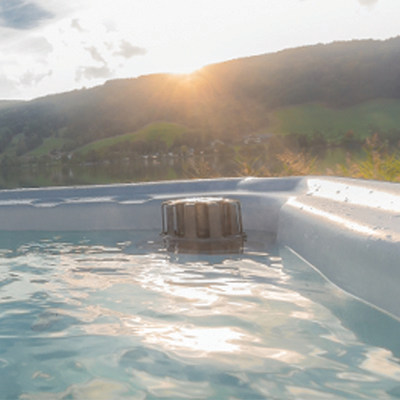 Round classic hot tubs with whirlpool flow *DTS™, and comfortable barrier free seating. These models will fit most any need from size to depth and accommodate those wanting a simple hot water therapy solution and the best value. Stainless steel adjustable Jetting and an LED light are standard in this series. Most models are convertible for 110v or 220v electrical hook ups. LED Mood Lighting Package *MLP™ is an option in this series. This value series is designed to provide an easy “plug n soak” option while providing Nordic’s exclusive *DTS™ Dual Therapy System. The combination of High Whirlpool Flow and Back massage Jets for the ultimate in hot water Therapy. With standard features usually found on top of the line models to include: stainless steel adjustable Jetting, LED light, ozone, T-20 insulation upgrade, and an installed GFCI cord.